Earlier this week, as I was looking through my well-worn copy of How To Cook Everything for dinner ideas, I stumbled upon a recipe for fresh cheese. After making pasta with fresh herbs and ricotta that I had purchased here last week and then using the cheese in a few other experiments, I knew I had to give this recipe a try—not only because it looked easy and relatively quick, but also because it would give me the opportunity to tell people, “I made cheese. At home. Easy-peasy,” and wow them with my culinary talents. Certain dishes can give an ordinarily humble cook bragging rights, and cheese is one of them. I’m happy to report that anyone can earn such bragging rights—all you need is eight bucks, a big pot, some cheese cloth and a colander. That, and 45 minutes of free time. Bam! Fresh cheese. 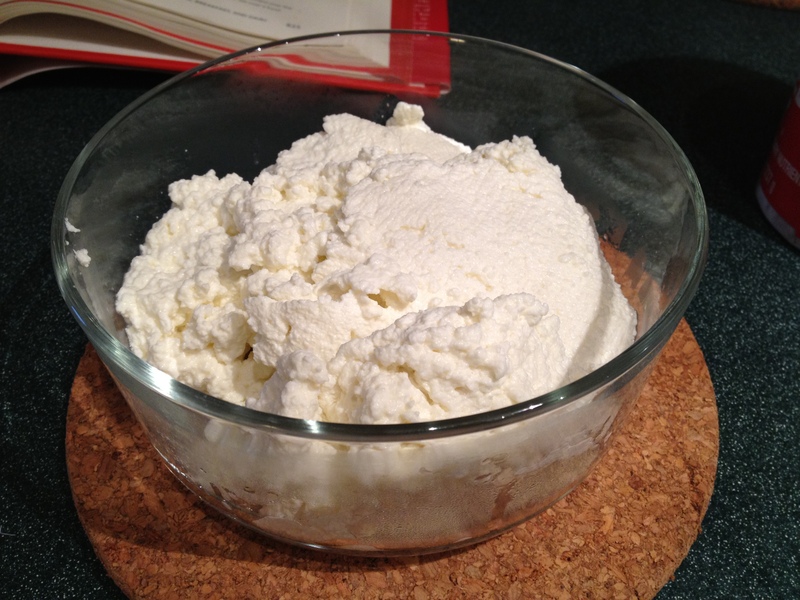 Tomorrow I’ll be posting two very simple, elegant and surprisingly light desserts to make with fresh ricotta. Both are tested and successful crowd pleasers. 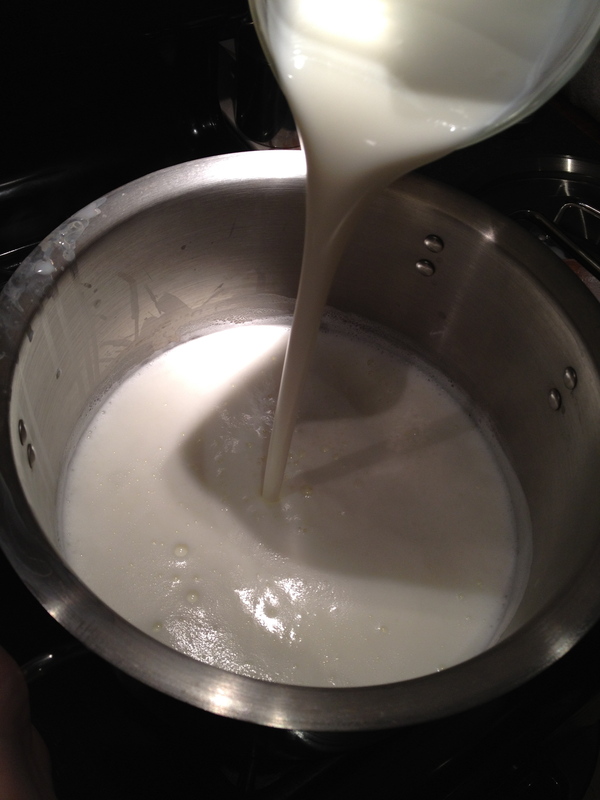 Put the milk in the pot and set over medium high heat, and cook, stirring occasionally to keep the milk from scorching. 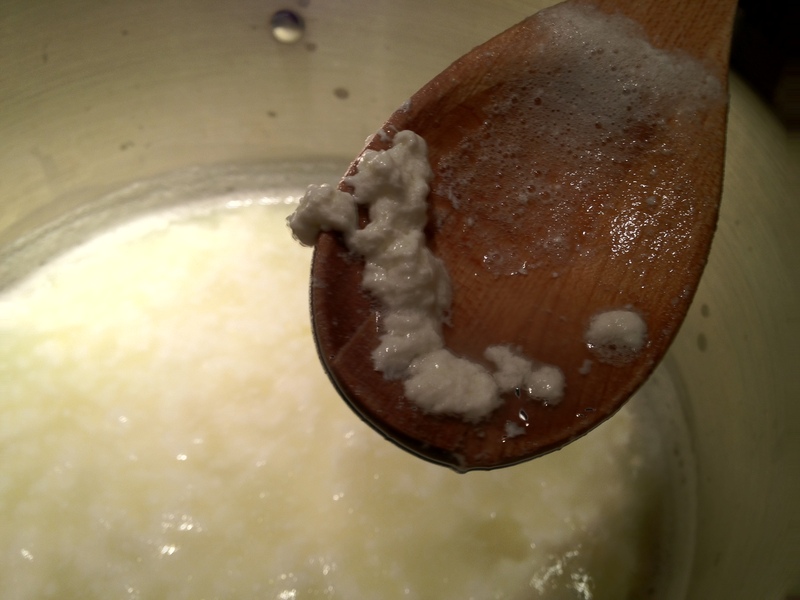 Continue cooking until the milk starts to bubble up the sides of the pot. With the heat still on, add all of the buttermilk to the pot and stir constantly. Within a minute or two, you’ll start to see curds form—they look like cooked egg white suspended in a yellowish-white liquid. That liquid is the whey. Remove the pot from heat, add the salt and stir. Carefully pour the mixture into the cloth-lined colander. Gently lift the colander out and set over the pot. Discard the whey. Allow the remaining whey in the colander to drain off for about 10 minutes or so. 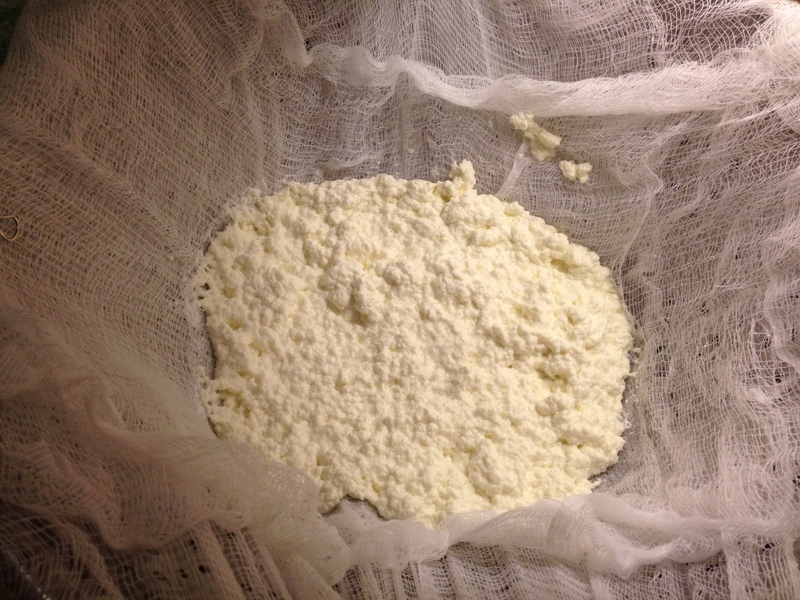 (Bittman recommends 30-60 minutes depending on your desired consistency, but I found after 15 minutes my ricotta looked a little dry, so I transferred it immediately to a glass container.) Allow the cheese to cool before refrigerating. Keep the cheese in a sealed glass or plastic container in the fridge for up to 4 days—if it lasts that long. 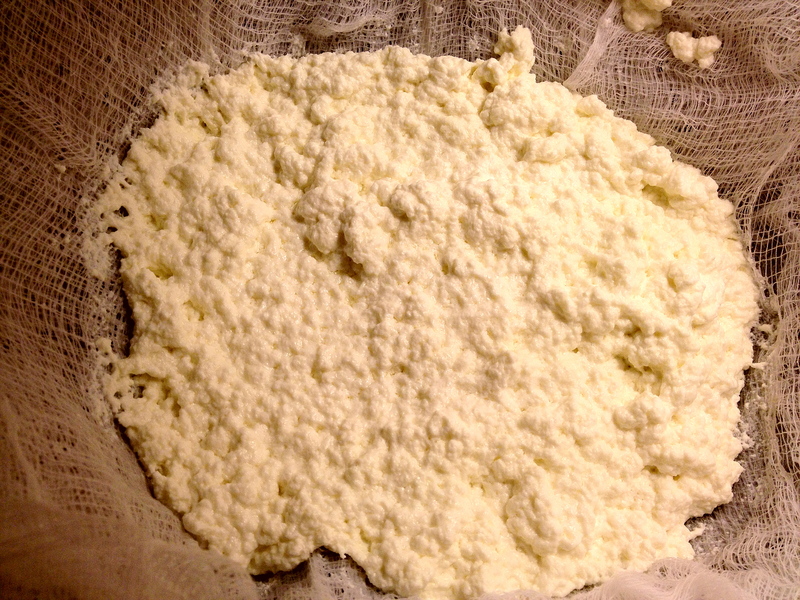 2 cups of ricotta will yield 8 1/4-cup servings of cheese. Each serving is 4 Points Plus. Notes: As first-time experiments go, this one was pretty successful, but I found that my cheese had not reached the perfectly creamy texture of the ricotta I picked up at Fairway last week. For one thing, I think I may have waited a minute or two too long to drain it, so I’d advise adding the salt the second you see the curds form, stir, then drain. Keep an eye on the cheese as it drains in the colander, and press it with your finger or a spoon to test its consistency. It’s better to leave more moisture in than less, because the cheese continues to absorb any liquid as it cools. It will loosen up with added water. Feel free to use whole milk, low-fat or skim milk in this recipe – Bittman asserts that any cow’s milk will work here, but the consistency and richness varies depending on the milk you use. 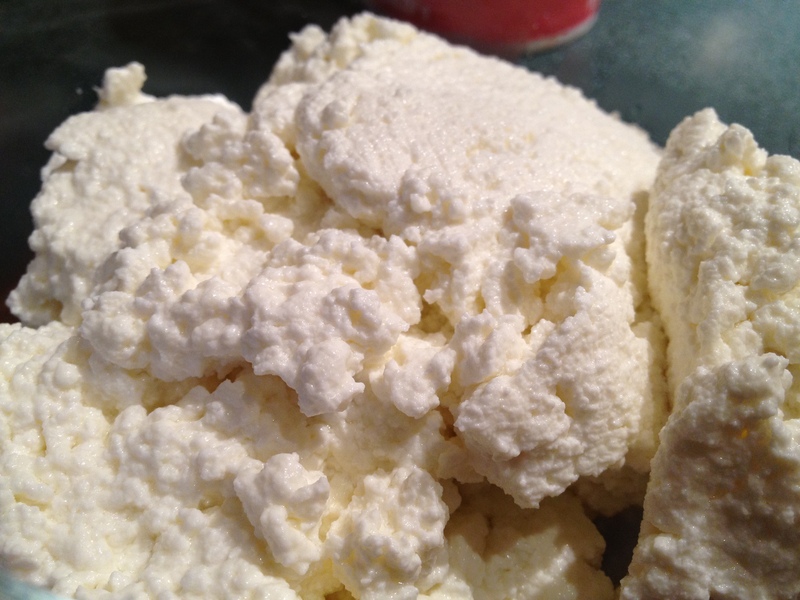 This entry was posted in Recipes, Tips and tagged buttermilk, cheese, cheesecloth, curds, dairy, easy, fairway, milk, photos, quick, recipes, ricotta, whey. Bookmark the permalink.